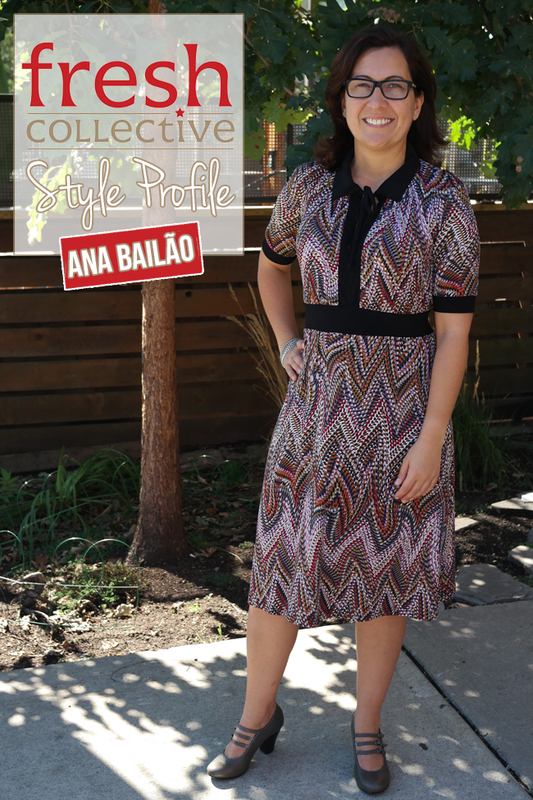 Style Profile – 15 More Outfits to Inspire You for FALL! Here are 15 MORE Fall Outfit Ideas featuring our gorgeous and talented ladies from our Style Profiles. Did you miss the last 15 outfits earlier this week? If you’d like to be featured in a Style Profile, get in touch. We’d LOVE to hear from you! 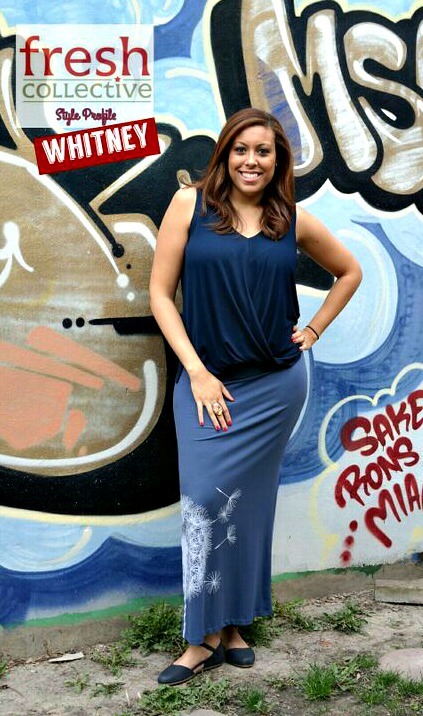 Our Style Profile is PACKED with style ideas and inspiration, all modelled by women from our community! Our customers have a certain something- they’re busy, and awesome and inspiring – and that’s how our Style Profile was born! Look 2: Leigh Dress by Mandala Design in 40’s floral. Also available in rust nitelite, pink nitelite, navy holes, aqua holes and teal nitelite. Look 3: Two way cardigan by Brenda Beddome in charcoal, teal, light grey and wine. Graphic tee by Yasmine Louis, Gloria flip skirt by Mandala Design available in purple, red and brown online. More colours in store. Look 1: Tunic by Desserts and Skirts, Essential Spanx Leggings available in umber or black. Look 2: Sumika Dress by Annie 50. Look 3: Top by Helene Clarkson and skirt by Michelle Carey. Sold out. Occupation: Owner of Sparkplug Coffee, fresh roasted coffee delivered to your door! Look 2: Dress by Studio Fresh – this style sold out. Look 3: Jo Slouch top available in purple, lime, black, navy, red and royal. Sara flip skirt available in nitelite, lace floral and rain. Look 1: Zig Zag top by Mandala Design, Yoga Jeans and Snap Cardigan by Elena Wang. 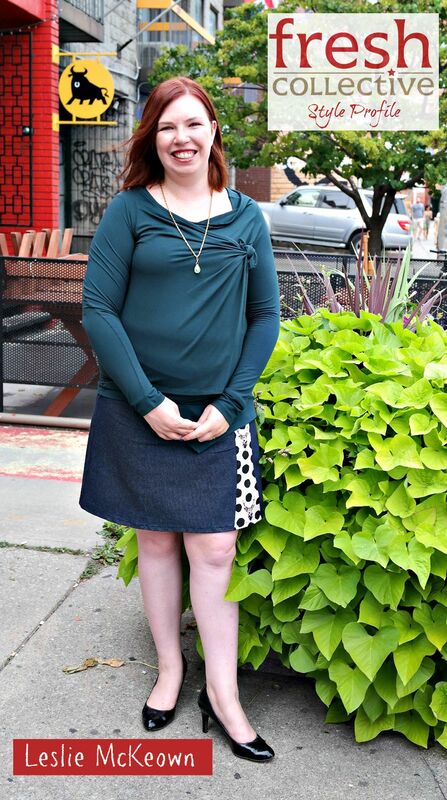 Look 2: Legendary top available in teal, blue and black by Melow; Geeky Deer Skirt by Desserts and Skirts. 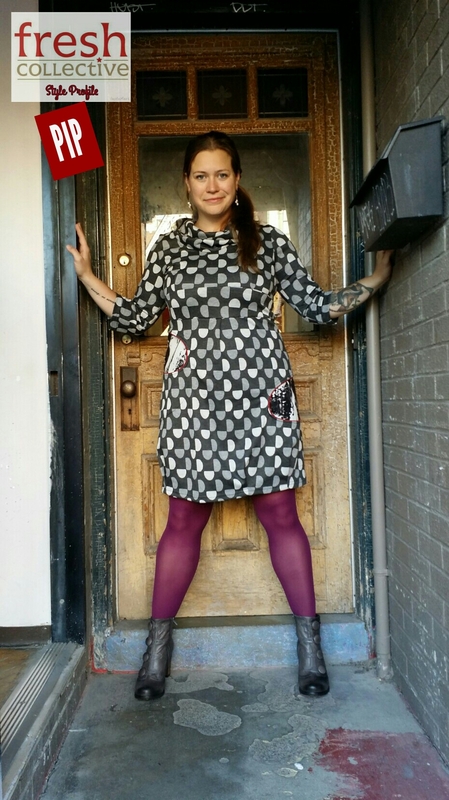 Look 3: Leigh Dress by Mandala Design in aqua holes. Also available in rust nitelite, pink nitelite, navy holes, 40’s floral and teal nitelite. 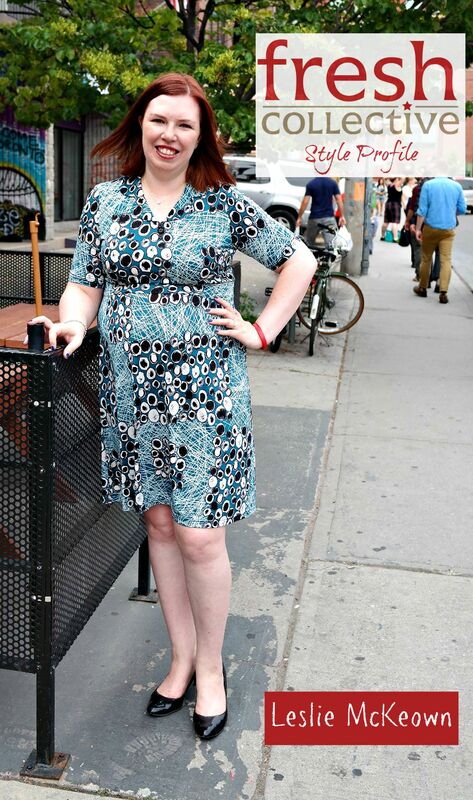 Look 2: Leigh Dress by Mandala Design in teal nitelite. Also available in rust nitelite, pink nitelite, navy holes, aqua holes and 40’s floral. 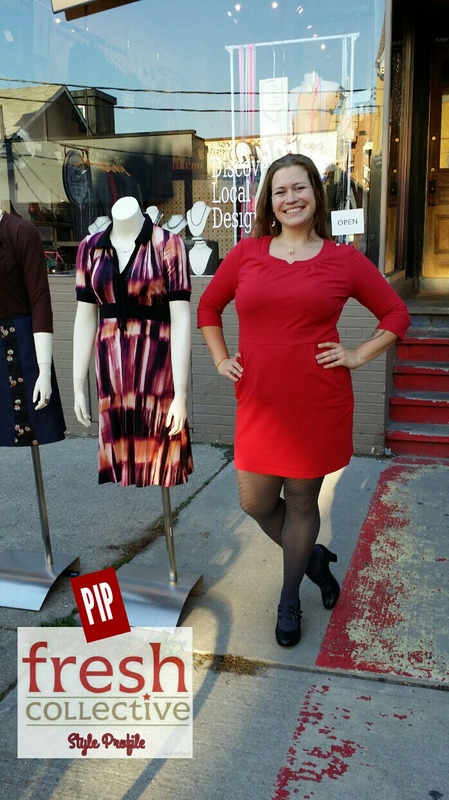 Look 3: Grace Dress by Kabuki in burgundy or grey. Occupation: Sleep Consultant, The Sugar Plum Sleep Co.
Look 1: Klatt Genesis top and Yoga jeans. Look 2: Zigzag top by Mandala Design (comes in blue and red) and Gloria Flip Skirt (comes in red, purple and brown online) by Mandala Design. (More colours available in store). In our stores, we often hear how well our clothes fit “real bodies” (as opposed to mannequins) – how they move and stretch to allow our customers to DO all the things they’re up to in our clothes! So we show those outfits on women with a variety of fabulous shapes and sizes. And women with real busy, fun and crazy lives to live in the clothes! Look 1: Jo Slouch Top in lime (as shown). Also available in black, purple, red, navy, and royal. 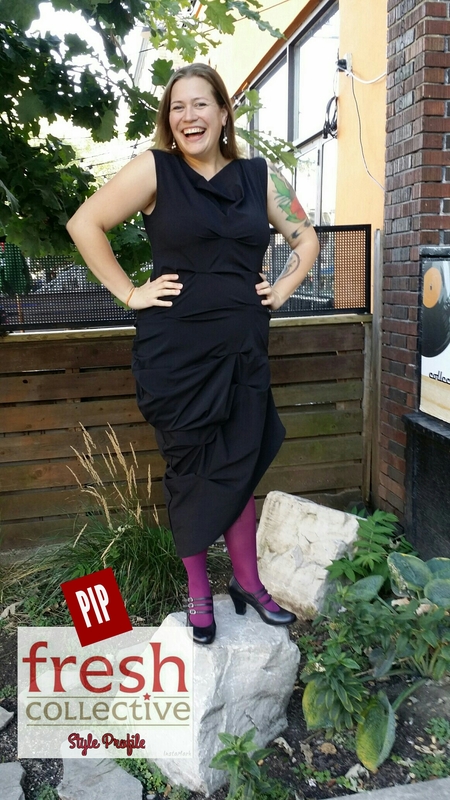 Sara Flip Skirt in Nitelite as shown. Also in Rain and Lace Floral. Top and skirt by Mandala Design. Look 2: Brenda Beddome 2 way cardigan in charcoal (as shown). Also available in wine, light grey and teal. Shown with Yoga jeans. Look 1: Brenda Beddome 2 way cardigan in wine as shown. Also available in light grey, charcoal and teal. With Essential leggings by Spanx (comes in black and umber) and a graphic tee from Yasmine Louis. Look 3: Neighbourhood tee by Candi Factory (in-store exclusive) and Yoga jeans. We’re so excited and inspired by our customers that we wanted to showcase (OK, show OFF!!) what they’re all about! So Style Profiles give women in our community to promote their business, cause, project, blog, art, music or whatever it is that they want the world to know about! Look 1: Alexia Top by Oom Ethikwear in grey and purple. Gloria Flip Skirt (comes in red, purple and brown online) by Mandala Design. (More colours available in store). Look 2: Graphic Pullover by Yasmine Louis, Dressy Sweats by Encircled. Do you have something you’d like the world to know about? If you’d like to be featured in a Style Profile, get in touch. We’re LOVE to hear from you! Lifestyle: Now that my kids have grown up, I’m enjoying living like a student again. Look 1: Brenda Beddome 2 way cardigan in wine as shown. Also available in light grey, charcoal and teal. Gloria Flip Skirt (comes in red, purple and brown online) by Mandala Design. (More colours available in store). 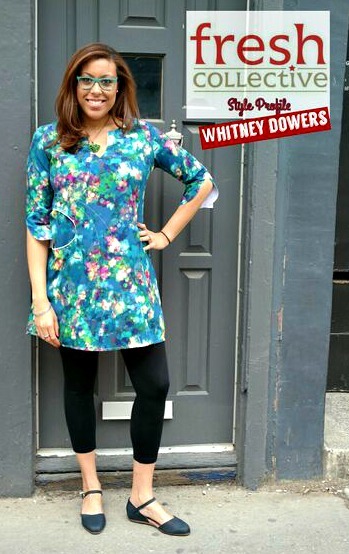 Shop for this dress in aqua holes print (as shown) here. It’s also in floral, navy holes, pink nightlight print, teal nightlight and rust nightlight prints. I don’t feel like I have a typical day; it is usually dictated by my clients. Beginning of the month is usually busy due to month ends and then towards the middle and end of the month I tend to have more time to work on my business and sales calls. Payroll weeks also tend to be much busier than non payroll weeks. Although I try to keep a fairly regular schedule, it’s never a dull moment working in finance and I tend to be busier than I anticipate! My family and friends are the most important part of my life. They are the ones that encouraged me to go out on my own and start my own business. Their never ending support is what allows me to keep going despite any challenges I face. Shop for the top in teal (as shown), blue and black. I would love for clients to view my work with them as a positive and easy experience, especially when numbers can be the most stressful part of running a business for many entrepreneurs. I love to wear outfits that portray my personality and professionalism, all while feeling comfortable. Shop for this top here in blue or red. I like how you can leave the store with so many unique finds, as opposed to typical trends you’d find elsewhere. 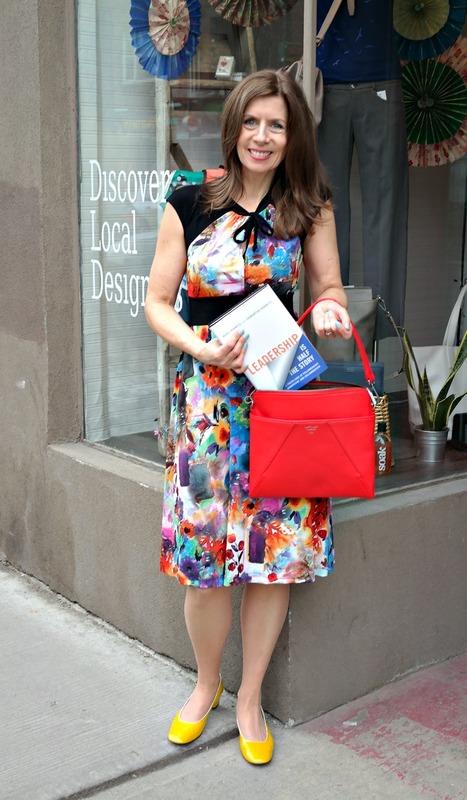 I also like the idea of supporting local designers and businesses! For any new inquiries into the Bookkeeping Redhead, I would love to offer a free financial check up of your books to help you better understand your financial statements and to also make sure they are accurate. If any discrepancies are found or you just need to get caught up we can work out a plan to get you there. What’s a typical day like for you? Teaching, student appointments, planning meetings, (when I can fit them in) — walking around the city, writing, hot yoga. What in your life is really important to you? Family (of course) but also a job that gives me the chance to express who I am every day. (Above) – Joanna talks about what she’s passionate about: teaching and writing about teaching in her blog Teacherpants. What would you like to be remembered for? Helping people see the world in a new way. What role does fashion play in your life? Fashion is fun as a spectator sport, but it is also one item in my professional tool box I love to give the impression that I put that extra bit of effort into the way I look: it’s a way of standing out but also showing respect — for my students, my co-workers, and my profession. 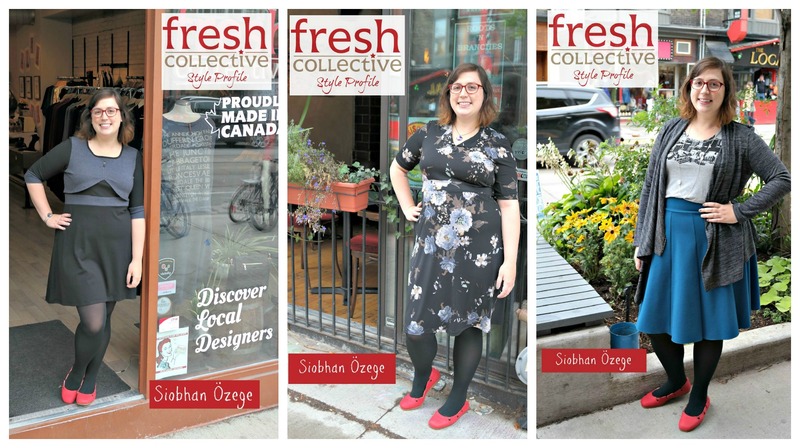 What do you love about shopping at Fresh Collective? The clothes give me the ease of mobility that I need to do my job well, but they still look amazing. I find that the clothes fit my body in a realistic way, that I’m not forcing myself into garments that weren’t designed for my body shape. 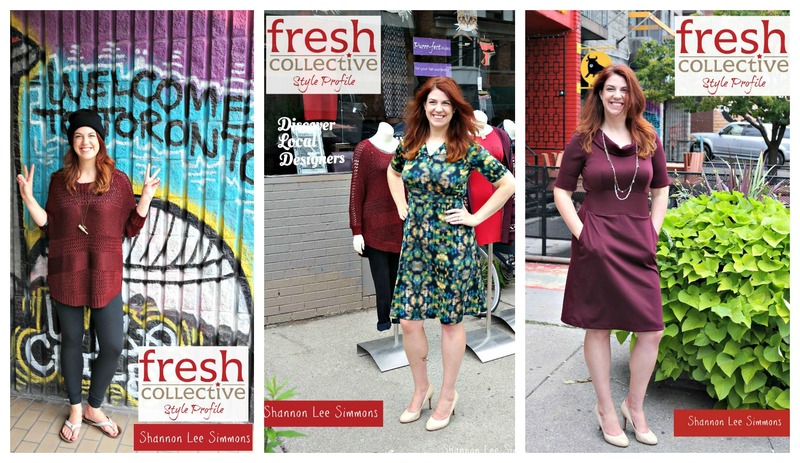 I’m much more comfortable physically, but shopping at Fresh Collective has also greatly enhanced my self-esteem. What do you have that you want to promote? My blog Teacherpants –it’s a very personal exploration of the experience of teaching. I’m not a big educational theory person: I’m trying to get at how teaching feels as an emotional, even physical, experience. My goal is to write posts that have relevance beyond the classroom, so you don’t have to be a teacher to relate. What’s a typical day like for you? It completely depends on the projects that I’m managing. It will usually start with a 7 am wake up, a bowl of protein enriched cereal and a mad dash to finish hair and make-up so that I can get back to my beloved laptop. From there I check my calendar and head off to any site visits or client meetings I might have that day. You can usually find me glued to my laptop between meetings at The Spoke Club on King West to get in some research or tend to emails. What in your life is really important to you? It’s probably frowned upon if I say my laptop so I won’t….without a doubt my husband is really important to me. He inspires me to be more creative and to master my craft like he has mastered his (he’s a professional Barber in Yorkville at Axe & Hatchet). What would you like to be remembered for? Client Service. A past CEO of mine once gave me the best advice. He said you are nothing if people don’t think you really listened to them. Clients might walk away from a project and say Whitney was prepared, Whitney never wasted my time, Whitney was truly creative but when they say Whitney really listened I know I have achieved their vision and met their needs. What role does fashion play in your life? It plays a huge role. Fashion is a way to express your identity and in the world of events we are constantly dressing to the occasion. Working an event is very different from attending one and I have outfits that cover everything in between. 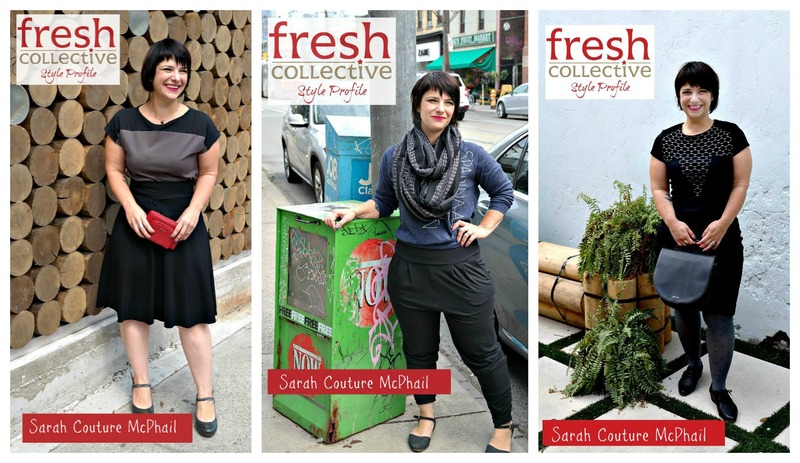 What do you love about shopping at Fresh Collective? The clothes are functional. For my industry we have to be able to load in every kind of decor but still look presentable when clients pop in to check on things. 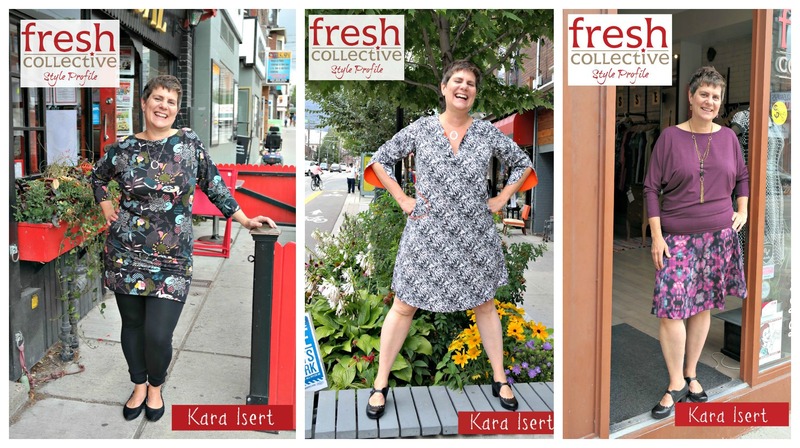 Fresh Collective gives so many options for comfortable fashion. Is there anything else we should know about you? Random fact. I designed and produced carnival costumes for 10 years for the annual Scotiabank Toronto Carnival. I now use those design skills to produce creative events. 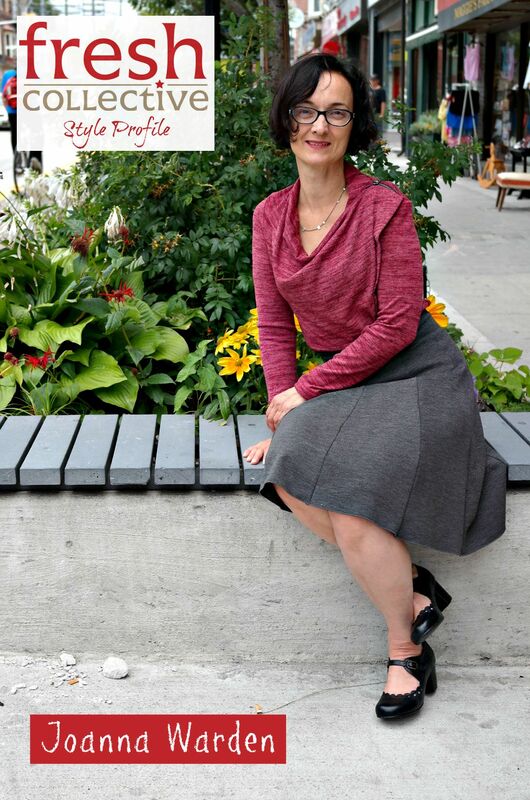 Lifestyle: Embracing a work/play lifestyle and loving my new downtown Toronto condo and life: lots of walks, bike rides, yoga, yummy food, dates with my husband, and connecting with new people. It’s lively and dynamic! One thing that has exceeded my expectation about Toronto is how friendly people are and how easy it is to meet new people. I skype and travel often for work and play. We have 5 kids around the world – London U.K., Brazil, Halifax, Montreal and Port Credit. What’s a typical day like for you? That’s part of the fun! My schedule is fluid with lots of variety. Most days involve connecting with people, meeting new people, collaborating, creating, coaching, writing and learning. What in your life is really important to you? My family & friends. Expanding my horizons: new things, knowledge, experiences and people. Living a healthy, active, compassionate life. Top: Charlie Slouch Tee – Mandala Design, $58; Scarf: Ambrosia Scarf – Jennifer Fukushima, $69; Skirt: Sara Print Jersey Flip Skirt- Mandala Design, $78; Bag: Schlepp Bag- Matt&Nat, regular price $115, now 20% off at $92. What would you like to be remembered for? I’d like to be remembered for being warm, encouraging and engaging! What role does fashion play in your life? I love clothes and accessories!!! Always have. For me it’s much more than a uniform – it’s a creative expression of who I want to be out in the world: colourful, cheerful, eye-catching and interesting while still being comfortable and practical. 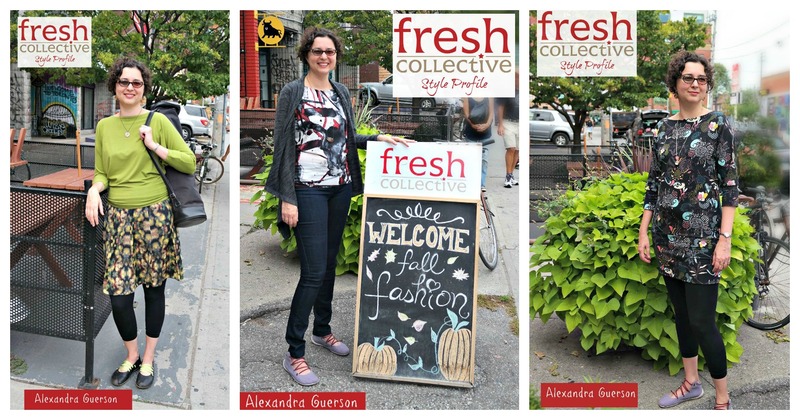 What do you love about shopping at Fresh Collective? I love the values, entrepreneurial spirit and creative flair that FC espouses. I love that the merchandise is beautiful, functional and unique. I love the engaging, easy-going service approach to help customers find the exact right piece or outfit not simply make the sale. Shopping at FC is a relationship not an event. What do you have that you want to promote? I’d love people to buy and read Leadership Is Half The Story: A Fresh Look at Followership, Leadership, and Collaboration available at bookstores and online bookstores all over. It’s our new book, published March 3rd by the University of Toronto Rotman Press. It’s a very contemporary conception of how to be highly collaborative and most effective when you are leading AND following in your partnerships and organizations. It’s really different than what’s out there. People are saying it’s “timely, refreshingly quirky, absolutely practical, important, a must-read”. I met my awesome and brilliant husband, business partner and co-author 10 years ago. We began researching and developing the ideas for the book, and dating. So this book is very personal and passionate, anything but the usual, especially for the leadership genre. We launched a new website and facebook page for events to complement the book: leadershipishalfthestory.com or flipskills.com and facebook.com/LeadershipIsHalfTheStory and we’re Sam&Marc@FliPskills_com on Twitter. Connect in!!! Ms. Haselgrove’s Picks and Tips! In my role as Product Coordinator for Fresh Collective, I’m responsible to find great design and quality and bring it to our racks for our wonderful customers. Sometimes I’m looking for statement pieces- that bold print or cool asymmetrically cut sweater- and other times, I’m looking for great basic style and design that’s simple, but never “plain”. These pieces from the Desserts and Skirts Spring 2015 line are those great basics. These are wardrobe builders that you can accessorize all kinds of ways to make them dressy, business casual or just everyday casual, while always looking polished and cute. In this picture I’ve topped the outfit off with a statement necklace, but a colourful silk scarf, a bold pendant or a blazer are just three of the many possible ways you could style this outfit. When choosing the wardrobe building pieces, I always look for the subtle style details that make the piece a blank canvas for accessories and your personality. There’s nothing “plain” about the simple pieces we look for at Fresh Collective! I have had the pleasure of working with Kat for several years now. Her jewellery line Curious Oddities is one of the most popular lines at our three locations, and Kat is a fabulous person to know and to do business with. Season after season, she puts so much work and thought into her business and designs and the results speak for themselves as customers come back time and again to add to their jewellery collections. Let’s learn a bit more about this creative powerhouse! Lifestyle: I live a passionately creative, colorful, sensual and expressive life, with lots of pie. My day begins when the cats decide that I’ve slept long enough and it’s high time that I feed them breakfast. Generally I shoot for a leisurely morning, especially when I know it’s going to be a long day in the studio. I work for myself and really enjoy what I do, so I’ve found it essential to block in some non-work, self-centre time, for coffee, yoga, breakfast and even a little reading. Most of my days are spent in my studio, making jewelry or photographing pieces; I love listening to Old-time radio detective stories and audiobooks while I work. Mid-day I usually take a break to walk to the farmers market to pick up things for dinner and get a little sunshine, then back to the studio till evening! I love checking out live bands at night when I’m feeling social, a bath and a good book when I’m not. My health, vitality and imagination, the close connection that I have with my mum even though she lives so far away, my caring and supportive community of family, friends and fellow crafters, good food, a garden, lots of personal space and of course, my cats! My creativity, my passion, my spirit and my ability to help people see and value the beauty and magic that surrounds them. I love watching fashions and trends emerge from street level and grow to mainstream, I find it absolutely fascinating. As well, I find it wonderful to see how younger generations pick and choose looks from earlier periods- mixing and matching pieces into completely new styles. Some of the results are a little frightening, but I have always loved fashion as a display of art and creativity, social challenge or personal expression. I love the great selection of Yasmine Louis shirts, I’m a huge fan of her work! Lots of other fantastic Canadian designers as well and the staff is very knowledgeable about the brands which is really helpful. 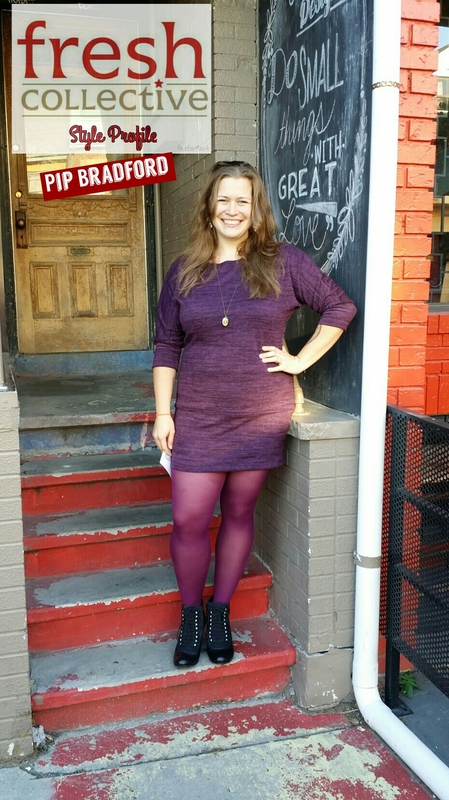 Pip Bradford has been a superfan of Fresh Collective for a few years now, and we adore her. 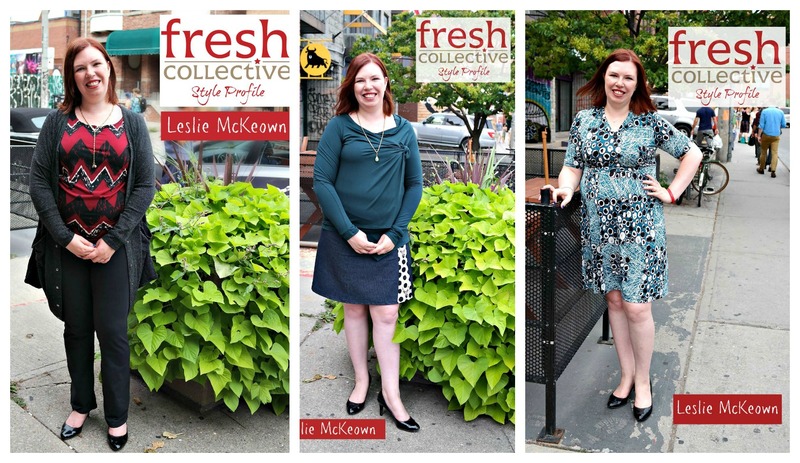 We adore her so much, in fact, that we used a picture of her for a document we created to describe our target market to educate new designers who join us what kind of woman shops at Fresh Collective! 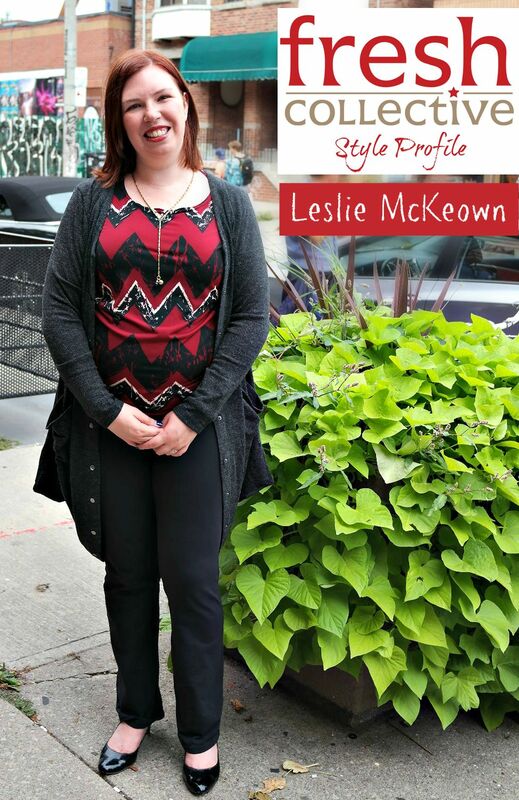 When she was at our Kensington location for her Style Profile shoot, she took over the store and sold things to other customers as I just watched! She’s fun, funny and totally awesome. Lifestyle: I go where the sea takes me. 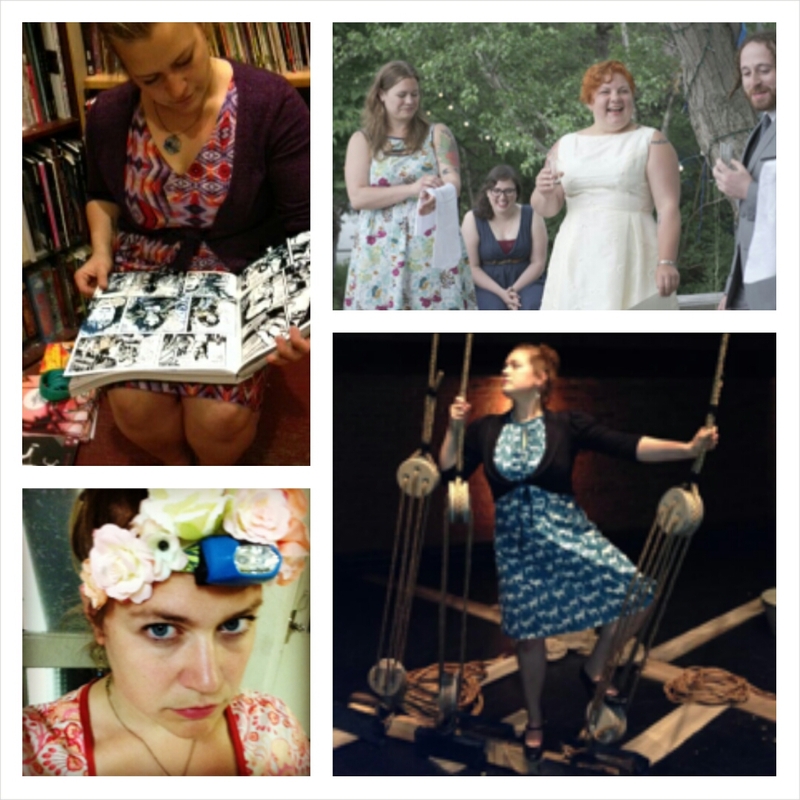 My career, my friends, and my library. Seriously I really love my library. Rocking out as hard as I can, whenever I can. I live a really full life, and I need my clothes to do everything I do, whether it be hanging lights at the top of a ladder, running a production meeting like a boss, reading comics in the corner of my favourite shop, or having drinks with my friends at my local. Every time I go to Fresh Collective, shopping feels like an awesome, fun, group event. Not only the staff, but all the other customers, make buying clothes there feel like a real community activity, which is tons of fun! There is nothing I dislike more than writing things about myself.